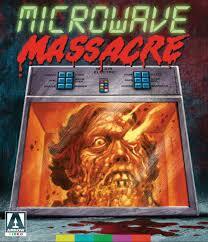 Boy where does one start with a title like Microwave Massacre. It sure is catchy that's for sure, with some great cover art as well. The film however, is actually more of a slapstick comedy. Its the story of Donald, a shluby no respect kind of guy who is married to Mary a normal wife who is trying to spice up her marriage via gourmet cooking. She constantly tries making new fancy recipes that unfortunately for her Donald finds disgusting. If that wasn't bad enough his co workers and Friends give him lots of grief about her cooking as well. One day poor Donald has enough and during an argument kills Mary. He needs to stash the body so he does like the title implies. He decides to cook her in the microwave. Well when you go this far all you have left to do it see what the corpse tastes like, and that's exactly what Donald does. And guess what he likes it. Not only does he like it but so do his co workers. He enjoyed it so much though that now he has to go out and find other victims to cook in his microwave leading to a few over the top gore scenes as well as over the top laughs. The gore is about a low budget as one can get, but it works in the context of this film quite well. As this is an arrow release not only do you get an immaculate transfer but it comes loaded with special features as well.